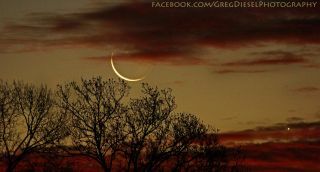 Greg Diesel Walck captured this image of the Moon and Venus from Currituck, North Carolina during the sunrise on Jan. 10, 2012. He used a Sony Alpha 65 camera with a 495mm zoom, ISO 1600, and shutter 1/8 second exposure to take the photo. The serene glow of the pre-dawn sky Thursday (Jan. 10) proved the perfect setting for two stargazers to capture dazzling images of the crescent moon and Venus. Venus and the moon shined close together before sunrise Thursday, with the dazzlingly bright planet appearing to the lower right of the slender crescent of the moon low in the southeastern sky. With Venus moving out of the morning sky, it was a celestial farewell of sorts for the planet and the moon that some stargazers couldn’t miss. "When I got to my location I could hear the sounds of the roosters crowing at the farm nearby and the moon and Venus were already big and bright and shining brilliantly through the warm morning glow," observer Scott Tully told SPACE.com via email. Tully captured his beautiful image of the moon and Venus over rural Connecticut. "I knew the timing of the sunrise, moonrise, Venus was going to be good, however it was somewhat cloudy. I kept running out to check the horizon and it paid off in this shot I call 'Morning Charade,'" Walck explained in an email. Scott Tully captured this sunrise shot of the crescent moon and Venus over rural Connecticut on Jan. 10, 2012. Stargazers hoping to see Venus in the early morning sky should plan to rise well before dawn in the next few weeks. By the end of January, the planet will rise over the horizon during the mid-twilight of sunrise, making it hard to see. By Feb. 1, Venus will be completely lost in the sun’s light. Venus will return as a bright night sky object in late April, when it will be visible in the evening sky. The planet won’t appear near the moon, however, until Sept. 8. Meanwhile, another bright planet is also clearly visible to stargazers this month, and you don’t have wake up in the wee hours to see it. Jupiter is currently shining bright in the evening sky in the constellation Taurus. It rises in the eastern sky and sets in the northwest at around 3 a.m. your local time. Jupiter and the moon will have a close rendezvous on Jan. 21, promising a dazzling for observers with clear, dark skies.